Happy New Year! A new year…a new look for Putting Up With the Turnbulls. We are still playing around with things here and imagine that they will change again from time to time…but don’t be fooled…we are still the same two crazy canning Canuks from Northern Ontario. This autumn, our friend provided us with a glut of butternut squash from her garden and with several small butternuts still hanging around in our cold storage room we decided to adopt this recipe to suit our glut. Place the butternut squash in a pan with just enough water to stop it from catching, and cook over a moderate heat for 10-15 minutes until it is cooked through but still retains its shape. 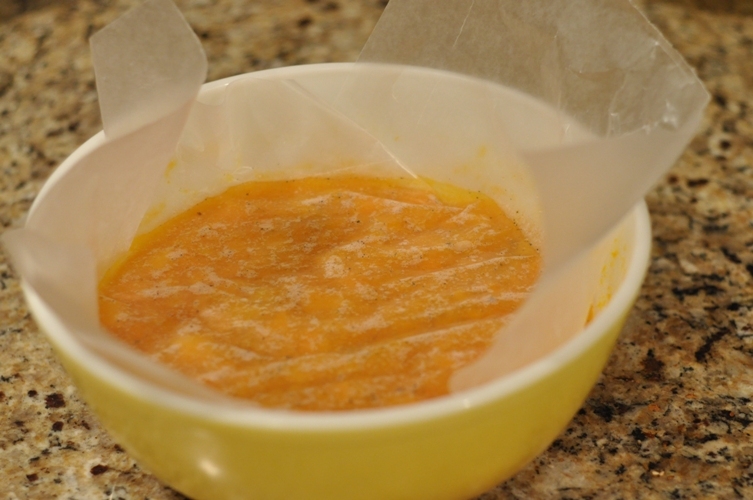 Drain off any excess juices, and when the pumpkin is cool enough to handle, chop it into finer pieces. Slice the vanilla bean in half lengthwise and scrape out the seeds with the blade of a knife. Place the pumpkin, sugar, and lemon juice in a bowl, tuck the vanilla bean pieces in among the pumpkin, and add the seeds. Cover with a piece of waxed paper pushed down onto the surface and leave overnight. The next day, pour the contents of the bowl into a preserving pan and stir over a low heat until all the sugar has dissolved, then turn up the heat and boil rapidly to reach setting point. Pour hot jam into hot sterilized jars leaving 1/4″ headspace, wipe rim, place lid and rings on adjusting to finger-tip tight. Process in the hot water bath for 10 minutes. 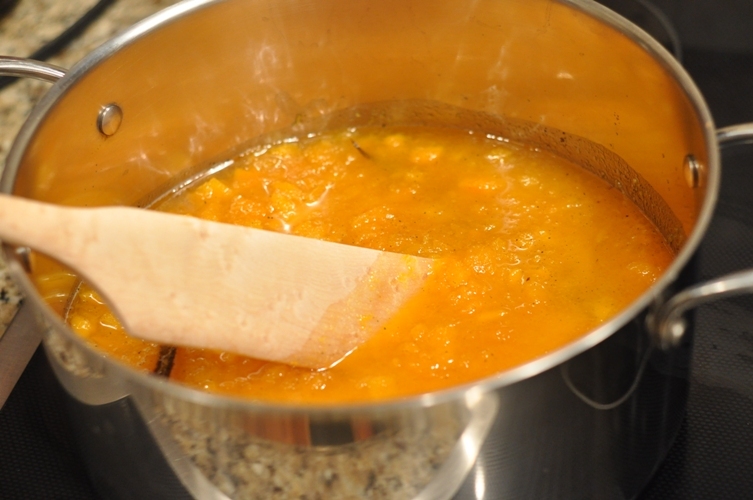 You may not think that a butternut squash would make a beautiful tasting jam…but this is where you’d be wrong. These home grown butternuts were a deep orange colour with a natural sweetness that peaked the interest of our senses. Their fleshy earthy goodness pairs wonderfully with vanilla to make a tasty spread for some home-baked scones or what about using it as pie filler (instead of pumpkin pie…why not butternut?). So, when you are faced with a glut of butternuts…we highly recommend taking the path not always preserved and try making them into some jam. Butternut is my favorite squash! Ooh, I can’t wait to try this recipe! This sounds wonderful! Really! I wish I had a glut of butternuts! Love the new look. I’m not sure I’ve mentioned (though I’ve meant to for a while), but I love the name of your blog. It’s so freaking clever that it has literally entered my mind at other times of the day. I received the Mes Confitures book I bought at your recommendation. I havne’t had a chance to read the recipes yet – but skimming – they look great! I wish there were more photos though. But I can always come here for the pictorial inspiration! I know what you mean about the photos…I too wish she had included more pics. Sometimes it’s the tasty looking picture that gets me to try a recipe! Glad you like our blog name…BIG thanks! I’m always telling Matt how appropriate it is as he’s the one that has to “put up” with me while canning. So do you leave the vanilla bean parts in through canning or do you take them out. The pods are removed during the canning process. Love to hear how you made out. 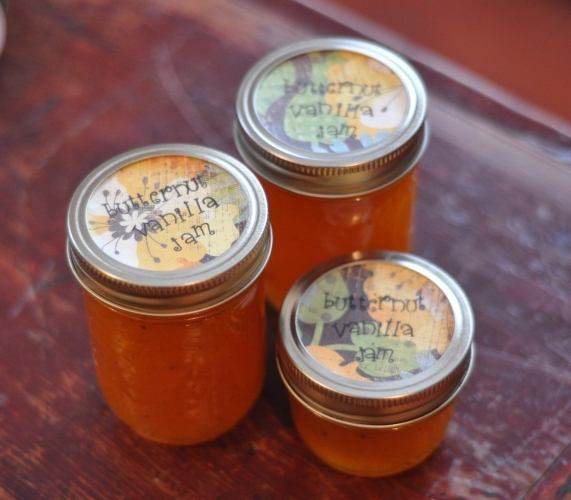 The jam turned out ok, but a little strong squash flavor for using by itself on bread, etc. Great with peanut butter, or something that is also salty. Makes a decent dip for crackers, etc. Does Butternut have enough acid to preserve it without adding acid such as lemon juice? You must add the required acidity to properly preserve butternut and even then it is perhaps best as the small batch item put directly into the fridge. Oops.. Juice from two lemons doesn’t seem like much? About how much is that, 1/4 cup?